Welcome to Have Your Say! Tanzania's new 60,000 seater stadium is set to open its doors in September, when it hosts an Africa Nations Cup qualifier between Tanzania and Mozambique. The new complex has an athletics track, an extendable roof and a lavish VIP lounge among many other new facilities. But do big stadiums really benefit football in Africa? Is it right to invest large amounts of money in one showpiece arena when there is a shortfall in money for grassroots coaching? Do stadiums have an inspirational quality to justify their high maintenance costs? 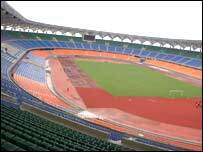 Is it important for the national football teams like the Taifa Stars to have a grand stage to play their matches on? Or is it more the case that many big stadiums become white elephants in the long-term? This debate has now closed. As an international football producer, I had the pleasure of visiting the stadium last week. With the exception of the athletics track, the stadium is pretty much finished. The seating is very confotable and the overall look and feel of the stadium is something the Tanzanians can be very proud of. The advantages of having these types of "super" stadiums allows more comfort and appeal when it comes to hosting international sporting tournaments, not excluding music concerts and other major events. A bigger and better stadium will also bring bigger crowds and support for national teams such as Taifa Stars. Good luck to the team when they meet Mozambique in September! As the 2010 World Cup is coming to Africa I think big stadiums will benefit football in east Africa. Some countries going for the tournament could use these stadiums to prepare for the World Cup . If African countries can afford the modern stadiums like Tanzania's new one it is surely one step towards development. This is the big strategy for improving the national teams too as well as you can see in the Taifa Stars, Tanzania's national team. I don't think big stadiums benefit Africa. There are lots of things to spend money on rather than stadium that will surely not boost the country's economy. For example here in Nigeria millions of US dollars was wasted in building the national stadium, when many Nigerians could not put food on the table for their families. Tanzanians are thinking in the near future. The next World Cup will be in Africa and with this stadium Tanzania is able to attract other national teams to have preparation towards in the World Cup in the east African country. There is nothing wrong with a country having at least one big stadium. What matters is how it is managed to generate revenue. A big stadium can fetch revenue for a country if her football governing body from time to time organises or hosts international football competitions involving reputable football playing nations or clubs. Matches involving Cameroon, Nigeria, Ghana, South Africa, Senegal, Egypt or Ivory Coast will definitely pull the crowd. Apart from football and other sporting activities, big stadium can comfortably host conferences, political rallies and even music concerts. Tanzania's new stadium is a worthy investment and an inspiration to the Taifa Stars. Size of the stadium can have mixed consequences. It could be a great inspiration to the footballers and indeed all athletes as they compete in a magnificent stadium. On that other hand, one can argue what is the point of building expensive stadiums when there is poverty?